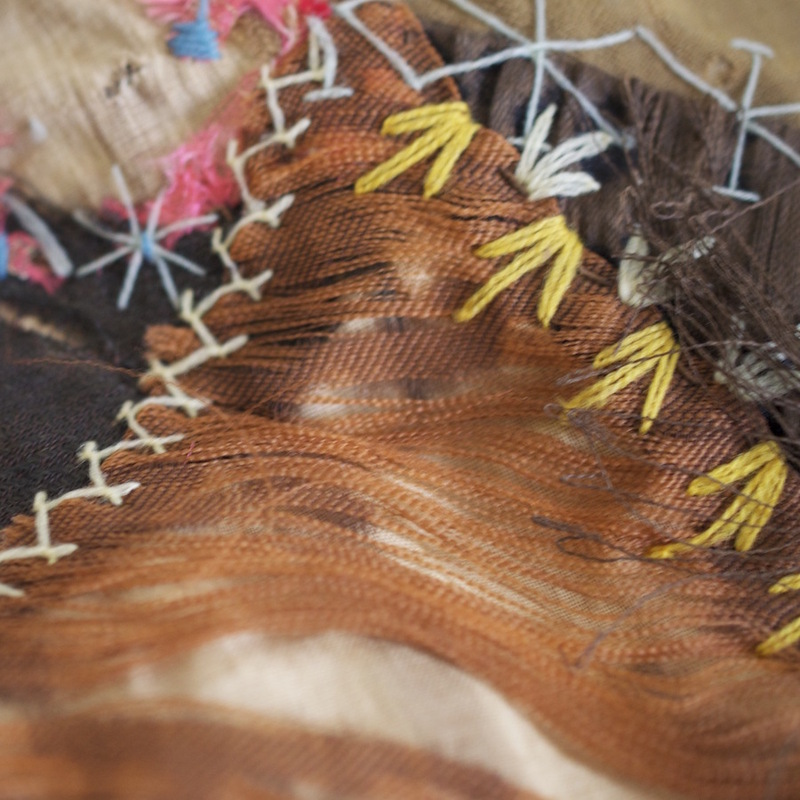 The American quilt is a critical visual unraveling narrative revealing an honest depiction of art and history in the United States. 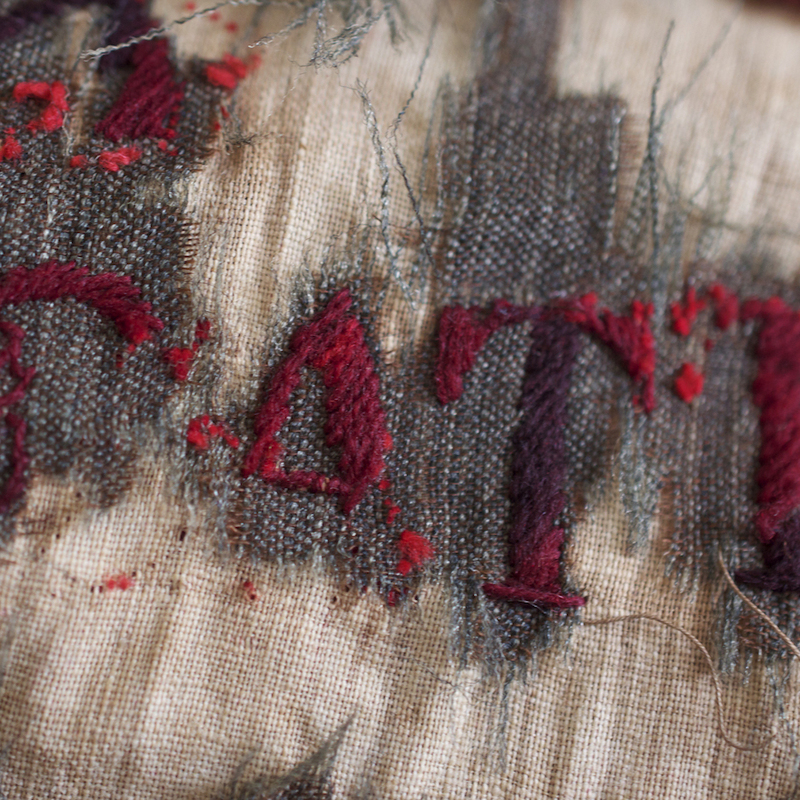 How do workmanship, authorship and historical documentation evidence our national identity? American quilts from Arkansas, as found objects are the subject of this interdisciplinary project. 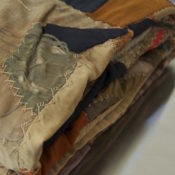 The found quilts being photographed are considered “crazy” in style due to the nature of the random connections between various colors, textures, patterns and parts. 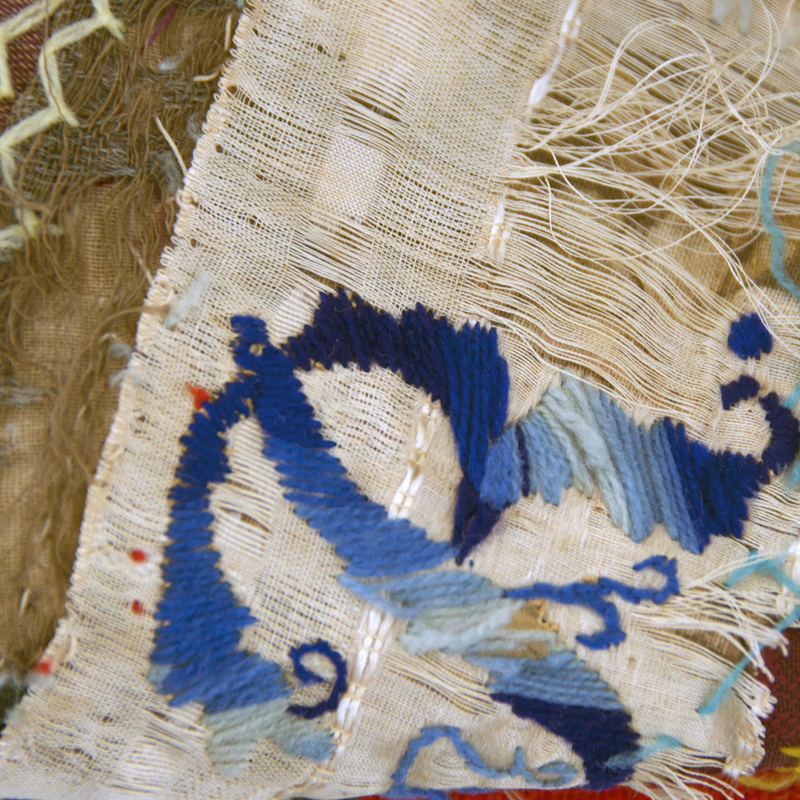 First and foremost, perhaps one of the most compelling realizations is to identify with the makers, artists and designers of the quilts, who were likely women unrecognized for making these colorfully complex, abstract works of art, who were by law, disallowed the right to vote in the United States as they pursued freedom through creativity. 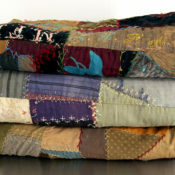 Additionally, the abstract fiber assemblages from the turn of the century (circa 1880- 1900), the quilts were made during a monumental point in American history, which was long before the highway system was constructed and they were purchased in the 21st Century for less than the cost of an average automobile’s tank of gasoline. 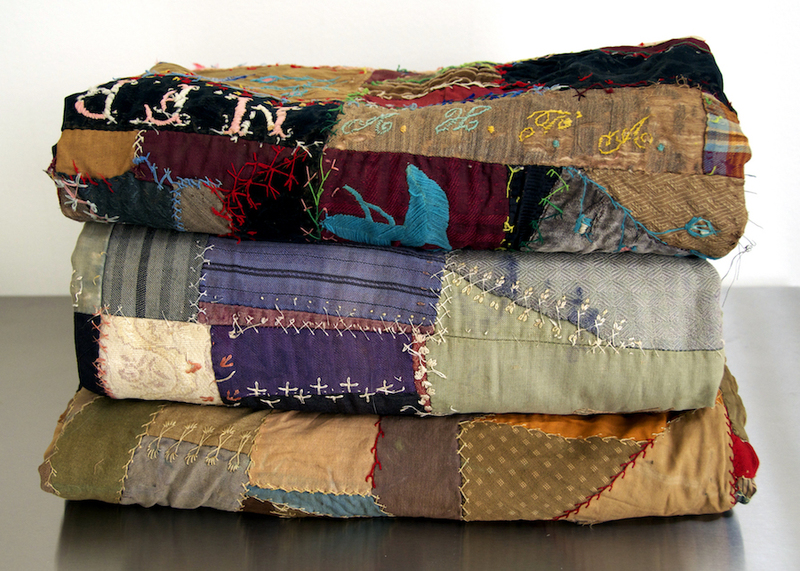 What questions can arise from the value placed upon the quilts in our current economy? How is American history being documented, preserved and regarded? How is American history being lost or discarded with each wave of industrialization, immigration and development? 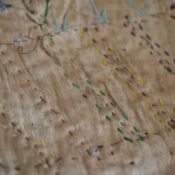 The answers to these questions requires one to look at an enormous picture, calling on the viewer to take a closer look at the quilts as critical, visual references that have the potential to capture a meaningful visual time and place. 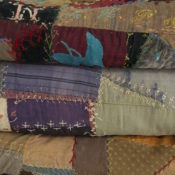 Recently, these American crazy quilts were found at a local Prairie Grove thrift store near the Arkansas-Oklahoma border. 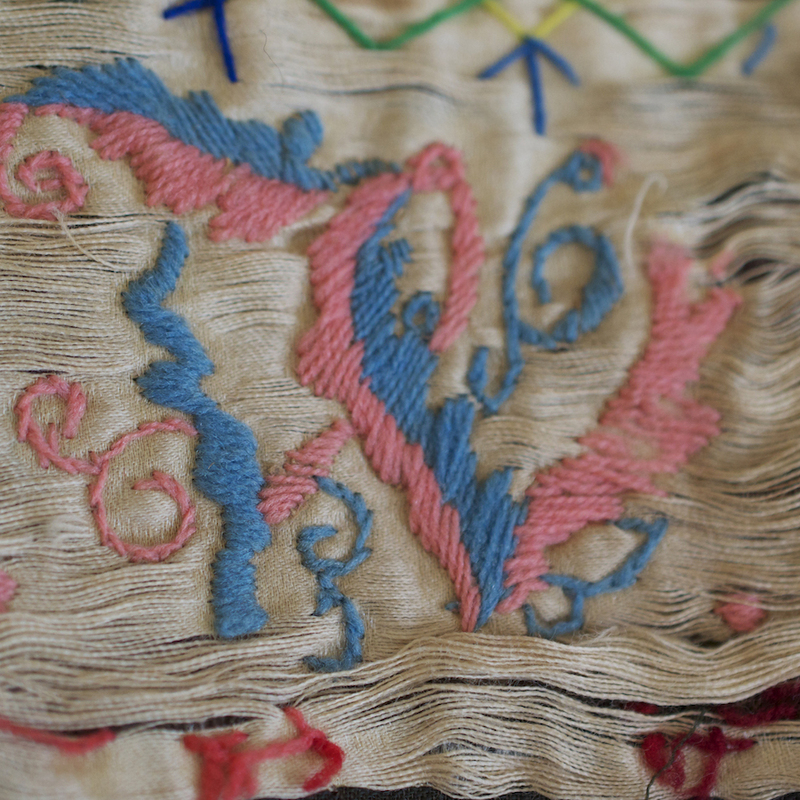 This discovery ultimately ignited a quest to consider further insight to cultural events during the time when the quilts were made. Investigating further, potential meaning within these abstract fiber constructions emerges. 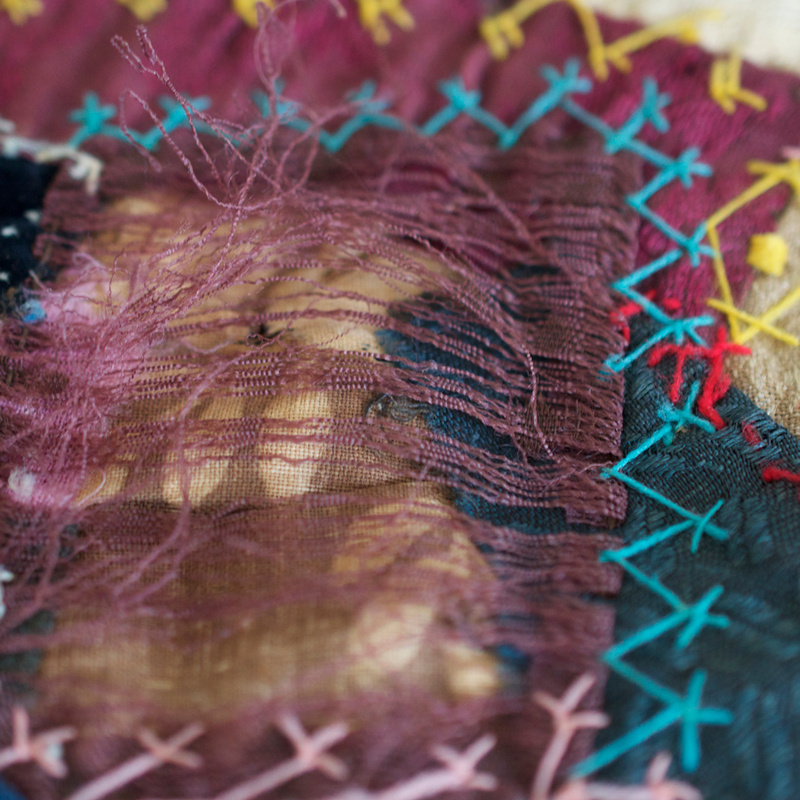 Finding parts and then piecing them together is essentially how the crazy quilt and this project becomes a hybridized handmade “found” object interdisciplinary endeavor. 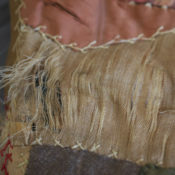 Next, considering the crazy quilts as fiber artifacts, one can begin sorting through cultural and social parallels evidenced by connecting process to the design elements from early settlers, whose efforts evoke infinite query. Let the pondering begin by thinking about and looking at the attention given to the collaged remnants that could have easily been discarded. 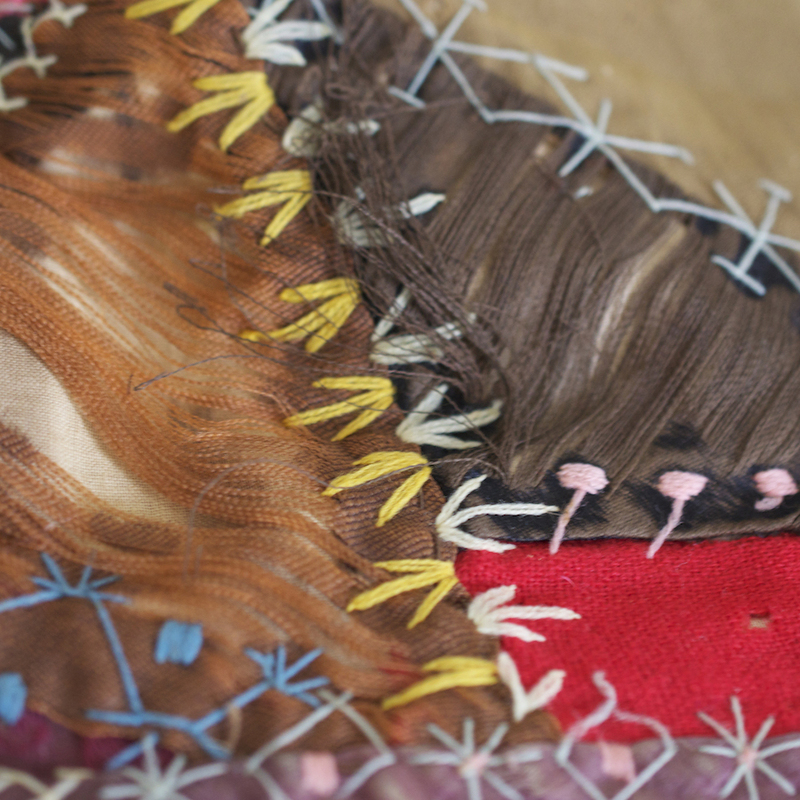 Through abstraction, they were instead creatively repurposed through craft, allowing visual insight into a time and place significant to American history. referenced date from 1886 and 1887. 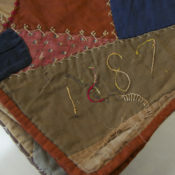 The quilt dated 1887 is official labeled Prairie Grove Arkansas and the 1886 quilt is labeled that it was sewn for “Lloyd”. 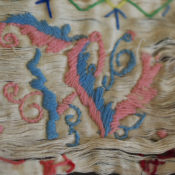 Both dates are marked in embroidered fibers. Furthermore, these American crazy quilts reveal compelling views into how humans have been driven to recycle materials and to create beautiful, yet are also practical and meaningful personal ancestral heirlooms. 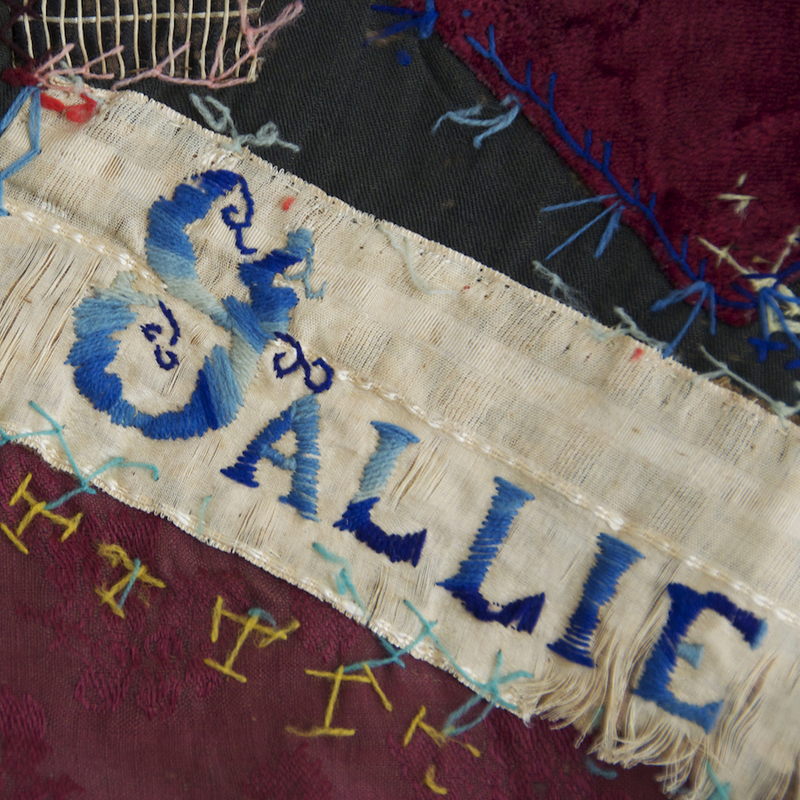 The textual component within the quilts demonstrates a human need to document people by personally acknowledging individual’s initials within elaborately scripted, embroidered monograms. Also, the quilt’s makers constructed abstract rhythmic compositions using shapes, textures, and materials through fibers and stitchery. What comparisons can be made between technological advancements from the era when the quilts were made and the current technological age? 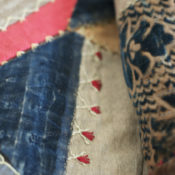 The quilt fabrications use cloth remnants, in abstracted angular shapes and marks made with embroidery thread. 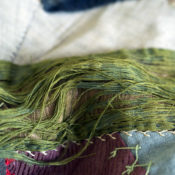 While focusing on overall design, meticulous handwork and repurposing materials seems to hold a sacred human quality, apart from technologically driven digital art forms. At the same time, digital photography affords the archive and distribution of images, bringing attention to the quilts’ unraveling insight into woven information that clearly establishes a significant time for the people who made the quilts. Looking further into the abstract designs, the access to materials and an ability to construct form within a square boundary apart from a grid is visually compelling. The distinctive lineage to the American quilts is somewhat vague however one can trace the historical disconnectivity between fine art and craft causing a blurring of social histories far beyond the United States, reaching around the world. How can contemporary art and academia achieve an American social history with greater authenticity? 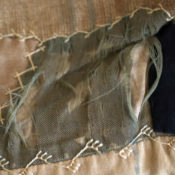 In the same way a viewer is charged with considering an abstract painting, perhaps placing such historical abstract found objects on view without complete knowledge will evoke further meaningful inquiry. Comparatively, how do the lines, symbols, shapes forming the quilts imply a strong relationship to American Abstract painting, as well as contrasts to later feminine fiber works, such as Judy Chicago’s The Dinner Party, 1979 or Annie Albers mid century weavings? Clearly, one can observe how humans attempt to piece together abstracted fragments of information over time in an effort to build a visual narrative.  One major goal for this project is to bring together multiple artistic disciplines to let truth continue to unfold. 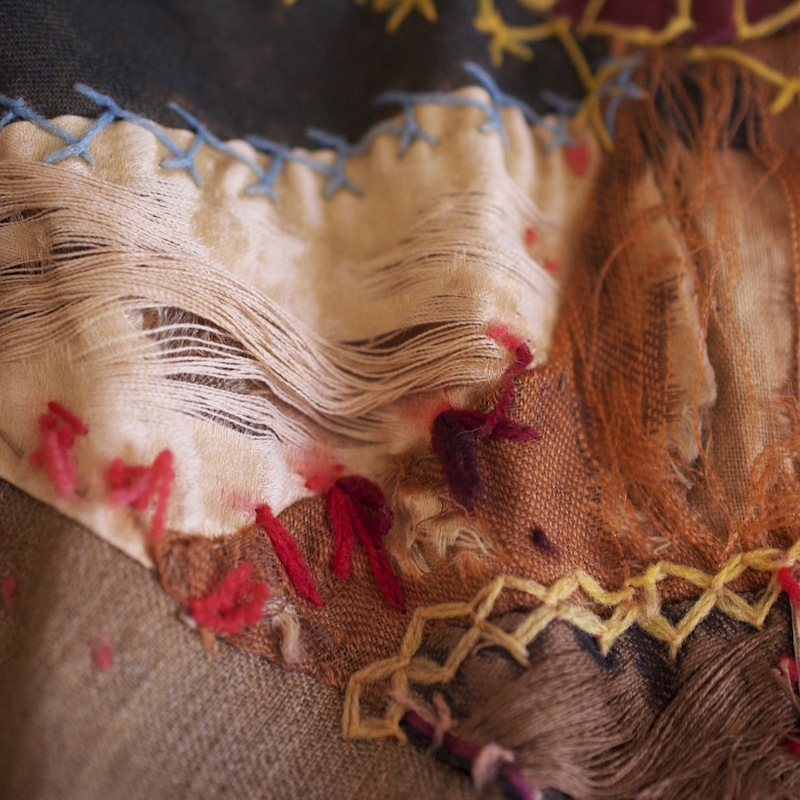 Through a macro lens, magnifying perspectives the photographs of the quilts become dissected parts to be seen in an attempt to draw connections between desperate, deteriorating abstracted pieces of America’s past. Onward, during American Westward Expansion, migrants gained interest in land deals in an attempt to stimulate a larger agricultural economy through the landscape’s grid structure unique to the central section of the United States. 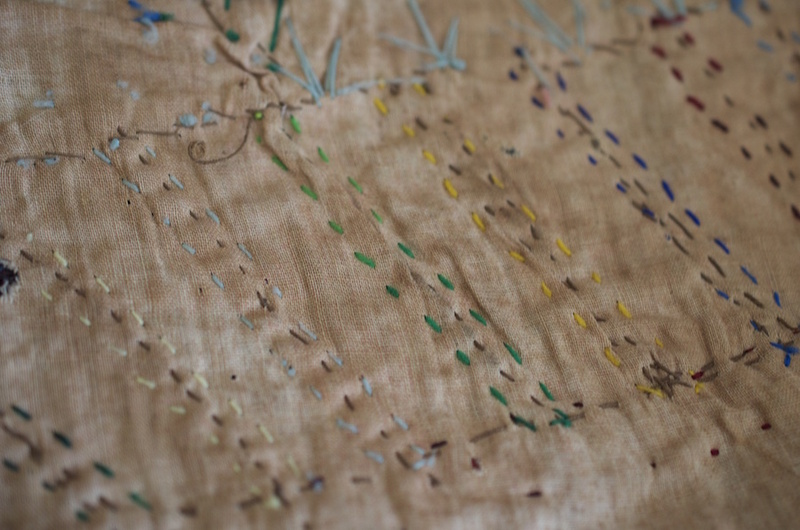 Such quilts equate to social maps leading the viewer through a time when the land and its people. 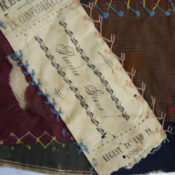 For example, as found objects, the quilts were made before and during the development of the factory-produced automobile. 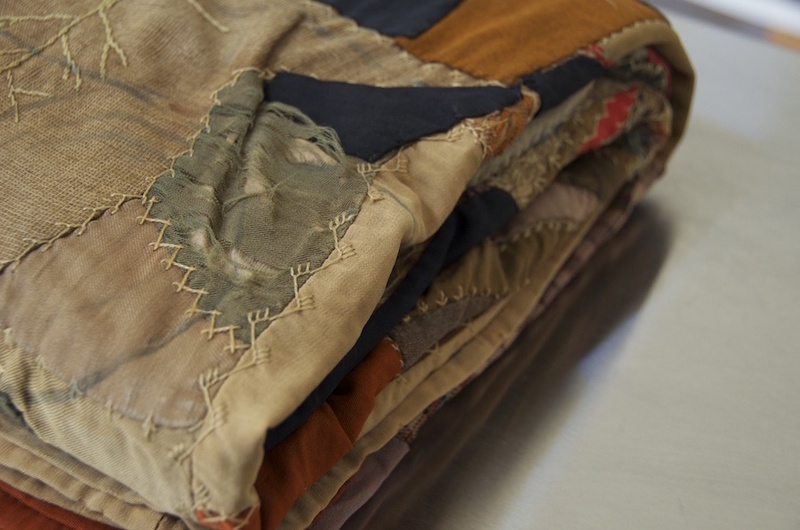 Worn and tattered, 1880’s American crazy quilts witnessed and contain evidence of a transformation and migration from buggies and covered wagons while the landscape endured a tumultuous point in American history. Continuing to ask questions, what do the quilt designs, symbols, fibers and colors suggest about American Westward Expansion? And how does this chaotic framework compare to Americas re-occurring status as a nation of new immigrants? 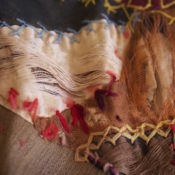 The practical art form of quilting chronicles a developing country’s shift from handwork toward the sewing machine and its technological development through abstracted fabric shapes and repetitive stitching. 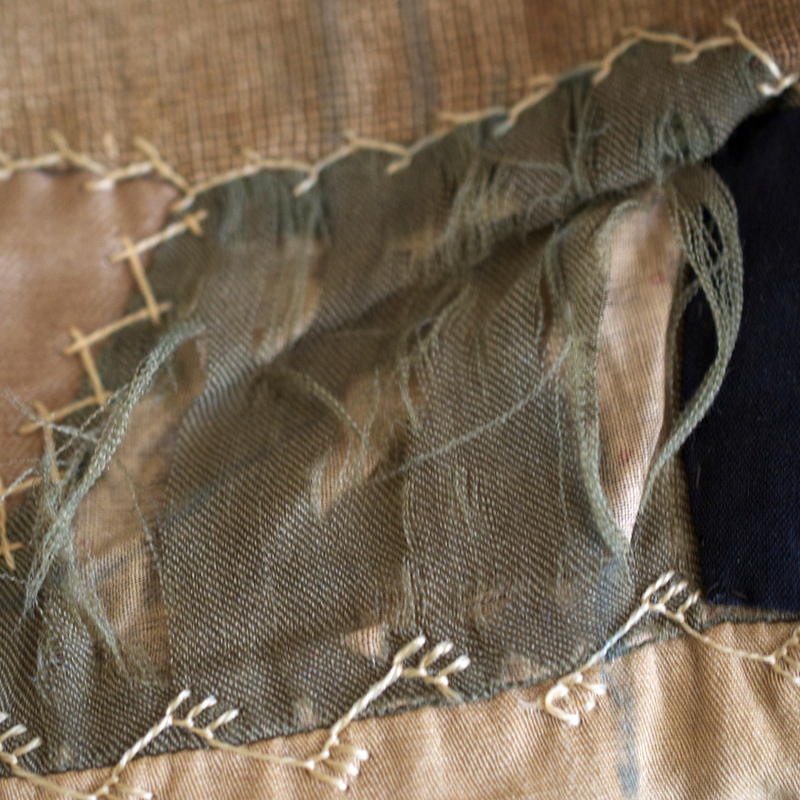 Falling apart, the age and condition of the quilts translates into a social landscape of American Westward Expansion—a time that would also lead to one of the worlds dimmest hours loomed—as clouds of human destruction cast shadows and devastation over the landscape, from the Dust Bowl to the World Wars; the globe would witness an unimaginable humility and loss of life. During American Westward Expansion the 1880’s a major transition took place from the handmade to the technological advancement of the sewing machine. It was a time of gradual access to electricity as noted in hybridized machine and handmade objects crafted in United States as a young country celebrated its first centennial. 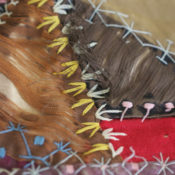 Crazy quilt designs were first documented as a topic in women’s magazines and were put on display at the 1886 Centennial International Exposition Worlds Fair in Philadelphia, Pennsylvania. 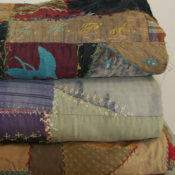 The American crazy quilts were assembled when the United States was establishing tensions between native born and new immigrants as well as aboriginals or “Native Americans”. During America’s “Gilded Age”, the population exploded into new territory. Thomas Edison was developing the phonograph and the light bulb. Furthermore, Thomas Jefferson arranged the Louisiana Purchase launching American Western Expansion, which would be a major precursor to J. Edgar Hoover’s 1950’s American Highway System. When distances seemed incomprehensible, barbed wire fencing divided wide-open spaces that where organized into the Jeffersonian grid structure. 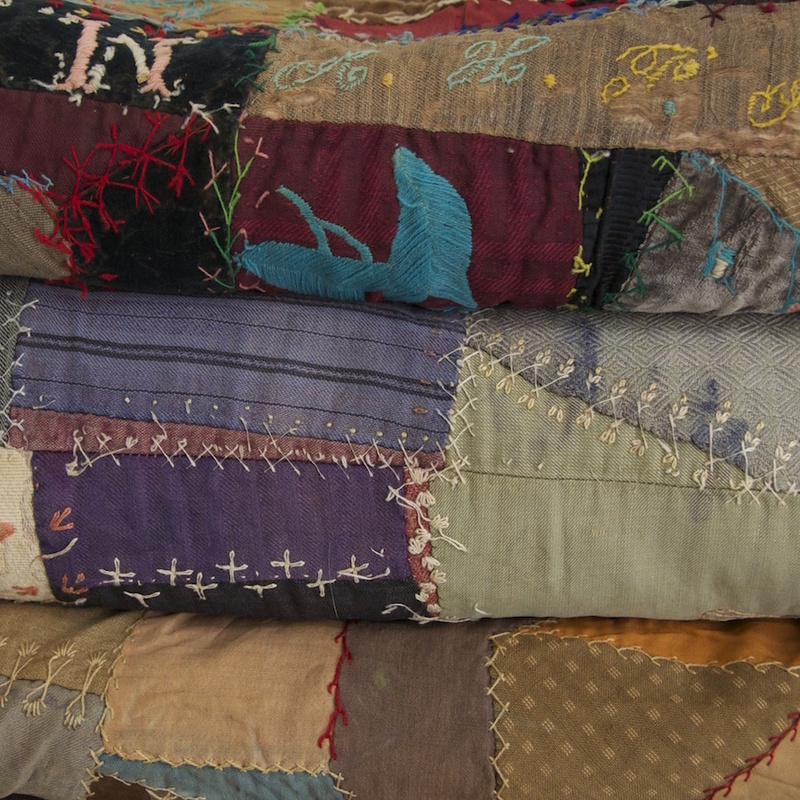 In the late 1880’s, when the Crazy quilts being referenced are dated—China’s abundant population overflowed and the American government placed dramatic limits on Chinese immigration into the United States—13 million people died from famine in Northern China. In dialogue with the crazy quilts, what are the contemporary concerns for China, India and the world, now situated in a familiar age of industrialization and new technological territory? Bringing forth more questions: What are the consequences of technology? How does it generate social development and degradation and how can it be used as a tool for conservation and preservation? As populations grow, descendants from American Western Expansion are disappearing. 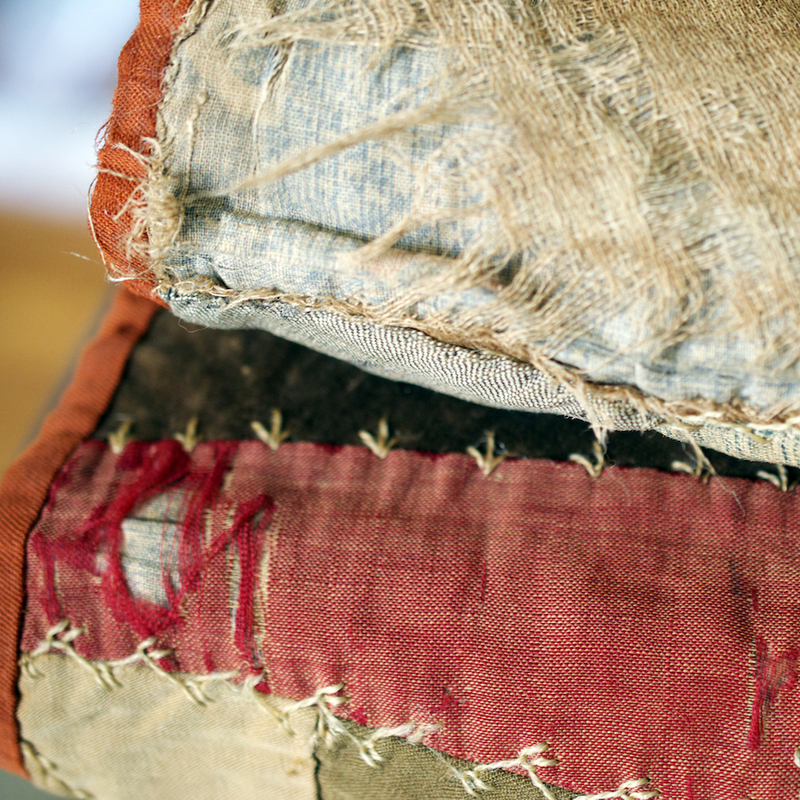 Today, the quilts—authentic artifacts of American history are without family members to pass them on to. 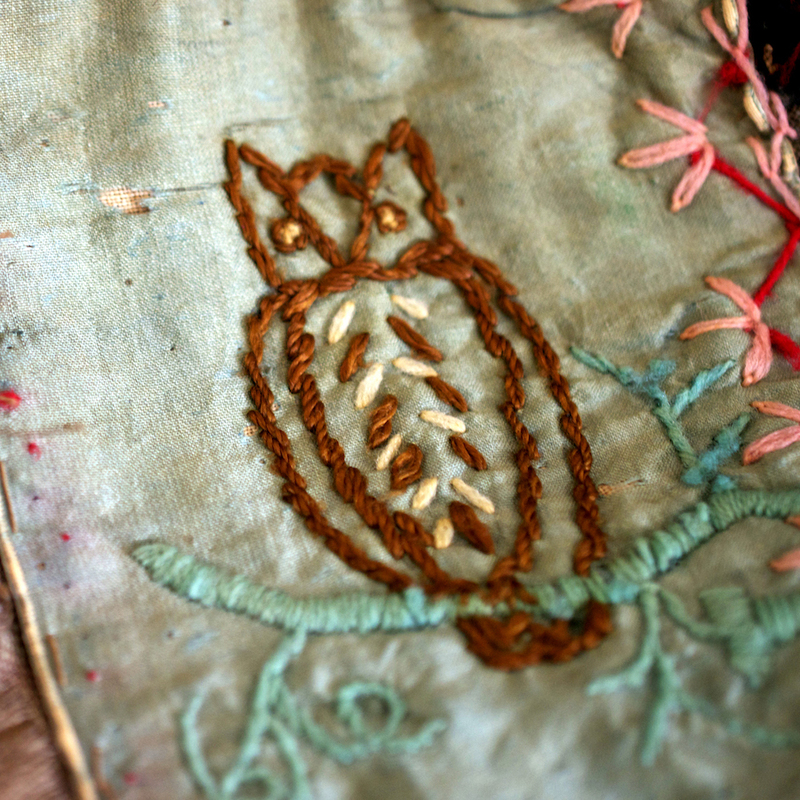 Historical quilts are surfacing in flea markets, thrift stores, where the quilts for this project were discovered. 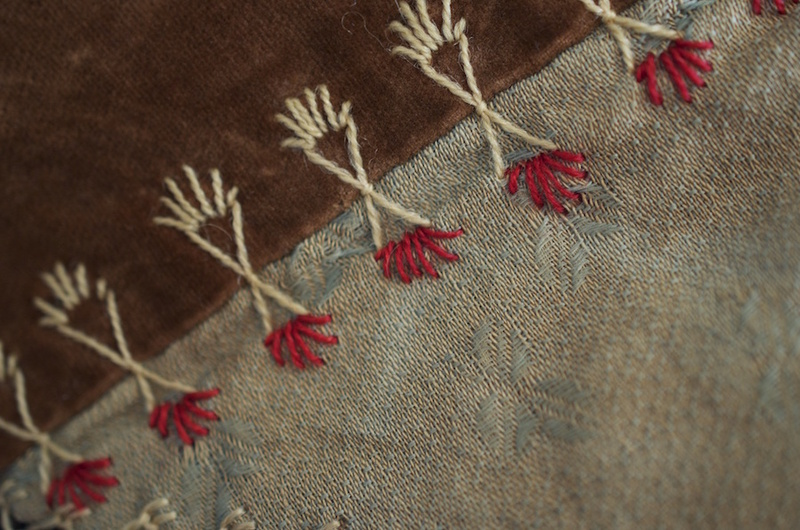 Through fabric fragments and embroidery, the sewing hand archived a civilization from the late 19th Century. 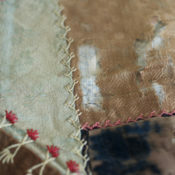 Paying homage to the land and to Western settlers, the quilts recall names in elegant stitchery combined with crudely shaped cuttings from recycled textiles. 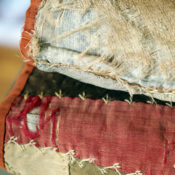 Repurposing the materials recalls putting skills to work and acknowledges displaced people whose circumstances shifted in search for a better way of life—“out West”. 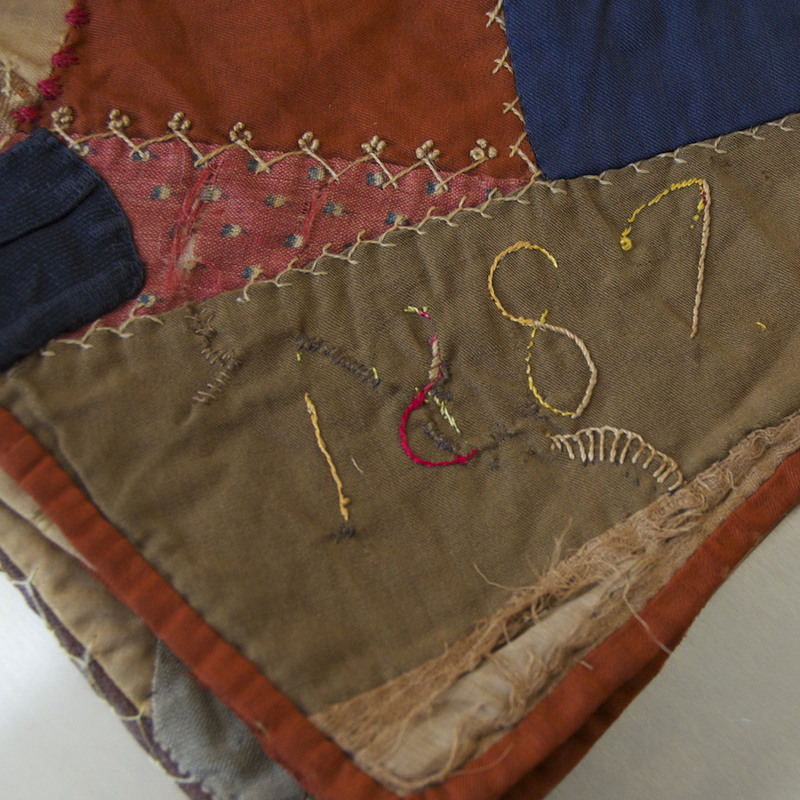 Tracing human existence, the quilts’ frayed fabric remnants call up American settlers. 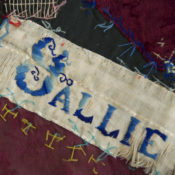 Nothing wasted; the thread barren scripted stitched initials signify names onto collaged fiber assemblages. 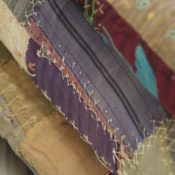 Apart from a romanticized version of American industrialization, the quilts form an American fabric, interwoven with the land and its people, ultimately establishing the Nation’s corridor. Questions are abundant: How are social histories archived? How does technological connectivity of people and place compromise cultural identities? How will cultures be preserved and remembered in the wake of the technological revolution? Alongside today’s timeline, history mirrors itself with technology and global migration presenting unsettling social situations, cultural revisions, and abandonment of the departed whose once revered work ethic based on the physical labor are being lost. 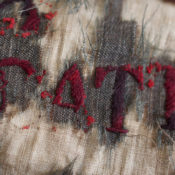 Finally, scripted names and monograms written in cotton thread, woven into wool and silk cloth, identify the maker and others whom were memorialized. 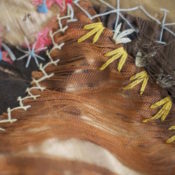 Textures combined consider color combinations with flowers, birds and butterfly motifs symbolizing awareness for nature’s beauty and the land. How will native-born heritage parallel with surrogate nationals and their relationships with their homelands? How will America’s diversity find unity on common ground within the social landscape in an age of globalization? 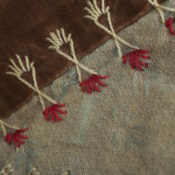 To conclude, American laborers, from the Arkansas and Oklahoma area, where the quilts were made, participated in the settling the Central Westward Expansion. Local to the region the lineage is rooted in—farming, orchards, crops, oil fields and then factories followed by the developing communication super highway through telecommunications. 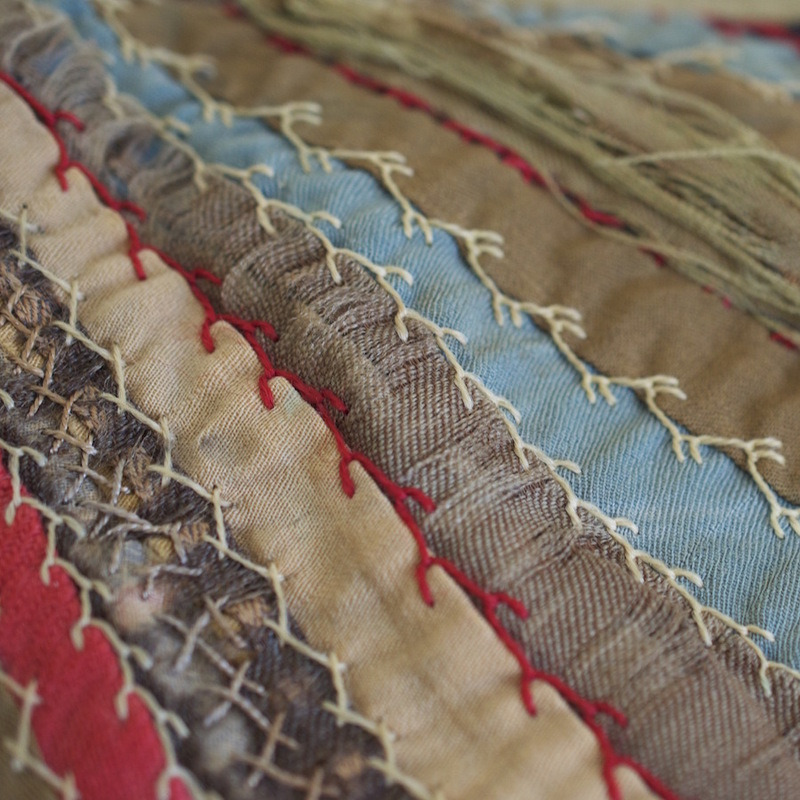 The quilts trace America’s story, stitch-by-stitch, piece-by-piece. 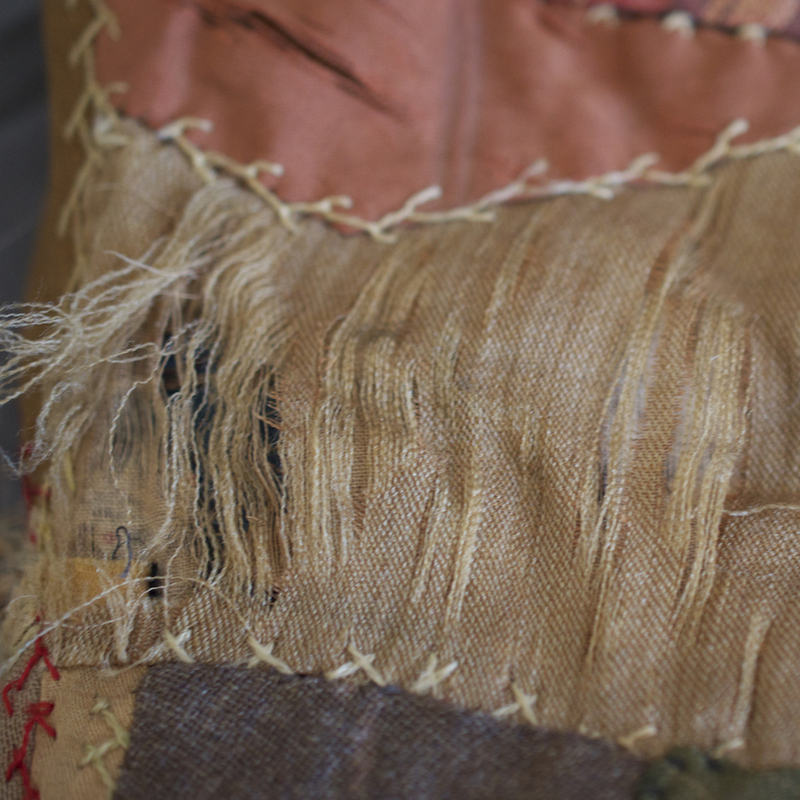 What we can learn from the past is invaluable and because the maker took time to tell the build the narrative, a human presence can be felt, remembered and reconsidered. 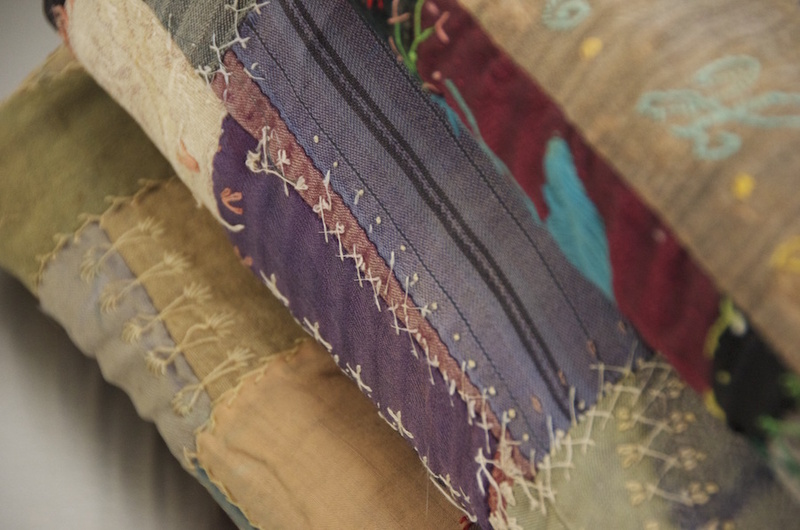 Questions continue to surface in an attempt to piece together abstracted parts as demonstrated by those who leave behind traces of their ideas and pursuit of freedom of expression through American abstraction within the crazy quilts.